Hello ... Hello ... my old friends ... It's great to see you once again! ELO Again journeyed "Down Home Town" to ELO's birthplace in Birmingham last night [Wednesday 11th March] as they put on an amazing show at The New Alexandra Theatre for the many enthusiastic Brummies [and visitors] in attendance. This was my third time of seeing the South Wales based group following on from their impressive outings at The Robin 2 in 2013 and Ludlow Assembly Rooms last year. This was an important gig for ELO Again as they advanced their show to the needs of a bigger stage and the even bigger expectation that goes with the territory. And it can be truly said that based on the evidence of this performance and the reaction of those watching, the night was a great success as we were not only treated to a professional live rendition of those familiar Jeff Lynne penned ELO songs [except, of course, for "Roll Over Beethoven"] that we all know and love, we also witnessed another energetic and charismatic display by the ELO Again string section and some truly magnificent image projection, especially that during the bands introduction during "Eldorado Finale" and "The Diary Of Horace Wimp". Highlights for me this time were "Big Wheels" and "Can't Get It Out Of My Head". My only observation regarding the sound was that the lead guitar was slightly under-amplified. But make no mistake about it, this was a great gig and a memorable occasion. 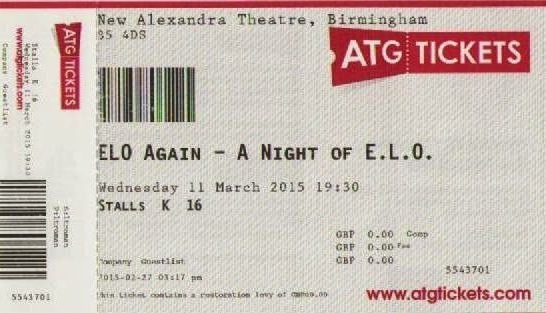 Be sure to catch ELO Again when they return to the Midlands next month on Friday 3rd April at The Robin 2 in Bilston, near Wolverhampton. Set #1: [Intro: "Eldorado Finale" & "Sinfonia da Requiem, Op. 20"]; "Standin' In The Rain", "10538 Overture", "Evil Woman", "Big Wheels", "Livin' Thing", "Hold On Tight", "Ma Ma Ma Belle", "Wild West Hero", "Showdown", "Sweet Talkin' Woman", "All Over The World", "The Diary Of Horace Wimp". Set #2: [Intro: "Prologue"]; "Twilight", "Do Ya", "Can't Get It Out Of My Head", "Confusion", "Shine A Little Love", [Gaelle's violin solo], "Last Train To London", "Telephone Line", "Rock 'n' Roll Is King", "Turn To Stone", "Rockaria", "Mr. Blue Sky", "Don't Bring Me Down", "Roll Over Beethoven"
ELO Again were: Colin Smith [Guitar/Lead Vocals]; Jim Ramsey [Bass Guitar/Vocals]; Mike Holcombe [Keyboards/Vocoder]; Clive Smith [Percussion/Vocals]; Gaelle Favre [Violin]; Sarah Waycott [Cello] and Sion Dawson [Cello/Guitar]. 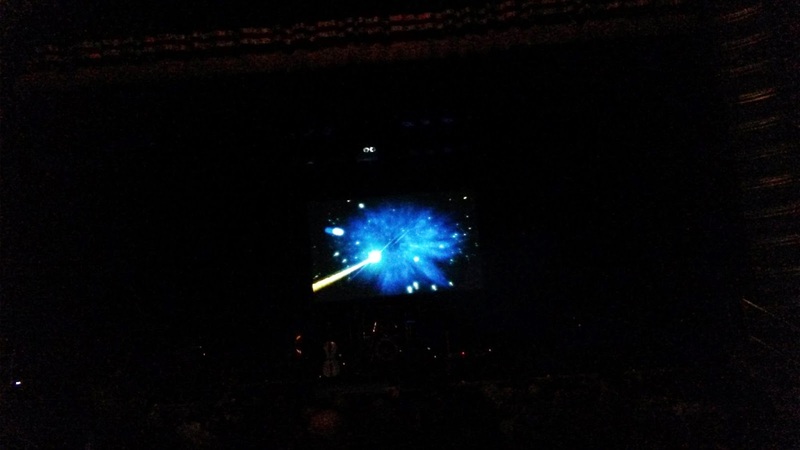 ELO Beatles Forever [ELOBF] recommends ELO Again to those enlightened folks who enjoy the music of ELO, Jeff Lynne, Roy Wood, The Move, The Idle Race, 'Brum Beat', The Beatles and related artistes. Thanks for posting this info Keith. WIll be seeing them on Saturday. 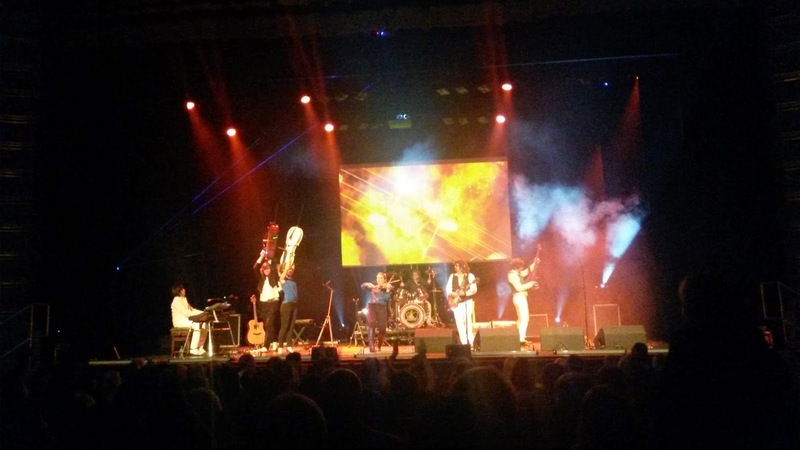 Look forward to what sounds like another great ELO tribute show.